While planning her second trek in Nepal in 2014, Linda Schuyler Horning‘s dream of family closeness is shattered. She learns her Kathmandu resident son, Adam, will marry Amita, a high-spirited Nepali woman she has never met. Invited, along with her husband, Paul, to be part of a traditional Hindu wedding ceremony, Horning struggles to balance her fear of letting go against a fascination with the unique culture and natural beauty of Nepal. How will Adam’s parents fare at a first meeting with their Nepali in-laws, and will age or elevation sickness prevent them from conquering the pass? Buhari: A Family Odyssey in Nepal is a compelling journey from the back streets of Kathmandu, to a unique family celebration in Pokhara, and finally onto the stunningly beautiful and challenging Annapurna Circuit, where success or failure waits just beyond the 17, 600-foot Thorong La pass. 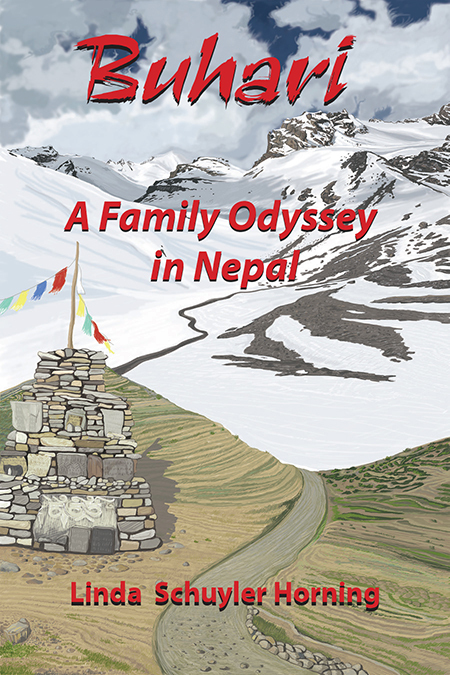 Buhari: A Family Odyssey in Nepal will be available on Amazon August 1, 2017.